Anti-charter school activists celebrated tonight&apos;s results at Fairmount Copley Plaza. 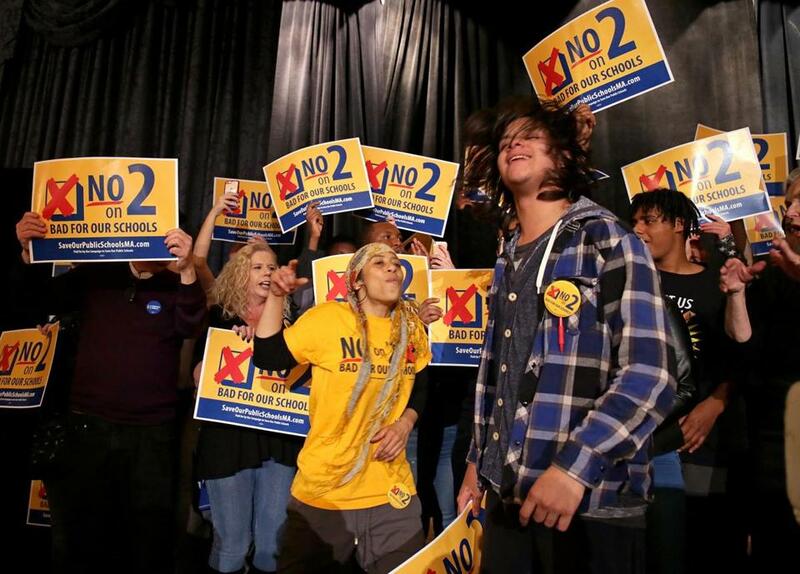 Massachusetts voters overwhelmingly rejected a major expansion of charter schools Tuesday, brushing aside calls for greater choice amid concerns about the overall health of public education. The vote is a major victory for teachers unions and civil rights organizations, which argued that charters are diverting too much money and attention from traditional public schools that serve the overwhelming majority of students. With 87 percent of precincts reporting early Wednesday, the “no” side was leading 62 percent to 38 percent. The lopsided result is a significant setback for Governor Charlie Baker, who aggressively campaigned for the referendum, saying it would provide a vital alternative for families trapped in failing urban schools. Question 2: Should Mass. lift the charter school cap? “I am proud to have joined with thousands of parents, teachers and education reformers in a worthwhile campaign to provide more education choices for students stuck in struggling districts, and while Question 2 was not successful, the importance of that goal is unchanged,’’ the governor said in a statement late Tuesday night. Charter schools are controversial, in part, because they have a freer hand with budgets, curriculum, and hiring than traditional public schools and are typically not unionized. The ballot measure would have allowed for 12 new or expanded charters per year, adding significantly to the existing stock of 78 charters statewide. But voter rejection has stalled the charter movement, which is bumping up against state-imposed caps in Boston, Springfield, and other major urban centers. The campaign smashed records for spending on a Massachusetts ballot measure, with the two sides pouring about $40 million into television advertisements, phone banks, and canvassing neighborhoods. Donors to the “Yes on 2” campaign, which had spent $24.2 million by the end of October, included former New York mayor Michael Bloomberg and a string of Massachusetts investors. But much of the money came from groups with such names as Strong Economy for Growth and Education Reform Now Advocacy that do not have to disclose donors, leading opponents to decry the “dark money” flowing into the race. The “no” side, which had spent about $14.5 million at last count, was mostly funded by unions, including the Massachusetts Teachers Association and the national wing of the American Federation of Teachers. Proponents of Question 2 gathered at Foley's Irish Pub and Restaurant to watch the election results. The opposition could not match the “Yes on 2” campaign on television advertisement spending. But the “no” camp had the support of prominent Democrats, including Senator Elizabeth Warren and Boston Mayor Martin J. Walsh. And it mobilized a sprawling field operation, with hundreds of teachers and liberal activists reaching an estimated 1.5 million voters statewide over the course of the campaign. “We have done an amazing job of building a coalition, building a true grass-roots movement,” said Madeloni, of the Massachusetts Teachers Association, campaigning outside a polling station at the main branch of the Boston Public Library in Copley Square Tuesday morning. When students leave traditional public schools for charters, they take thousands of dollars in state aid with them. And opponents focused heavily on this financial strain, raising the specter of cuts to arts education, transportation, and other services at the schools that serve the vast majority of students. But the shift in aid — an estimated $451 million statewide this year — does not necessarily mean that school districts end up with less money. A report by the Boston Municipal Research Bureau showed that the city has diverted money from other departments to the Boston Public Schools to make up for the loss in education funding. The “yes” side aired a series of television ads designed to blunt the financial argument. And a Boston Globe/Suffolk University poll from late October suggested the effort had some success. Just 37 percent of voters said they believe “charter schools drain money from traditional public schools,” while 41 percent said they have “no significant impact on the budgets of traditional public schools” and 20 percent were undecided. But the survey, like other polls this fall, showed that the “no” side had made substantial gains nonetheless — winning over more Democrats, independents, and women than they had in the spring. Christine Fischer-Rothman, 51, a Jamaica Plain lactation consultant with a son at Boston Latin School, said she voted against charter expansion. Research shows that Massachusetts urban charters have made substantial gains with black and Latino students, in some cases out-performing schools in white, wealthy suburbs. That track record attracted heavy interest from national charter advocates, who saw the state as an important testing ground for the movement. It also made race a key battleground in the fight over Question 2. But opponents such as Juan Cofield, president of the New England Area Council of the NAACP, warned that charters were creating a two-tiered system, draining money from the traditional schools that serve the bulk of black and Latino students. The most important state cap on charter growth limits how much money those schools can divert from individual districts. In most districts, it’s 9 percent of “net school spending,” which includes many, but not all spending categories. In the lowest-performing districts, it’s 18 percent. Cities such as Boston that are bumping up against the cap will not be able to add many charter seats in the short run after the failure of Question 2. But that will not spell the end of the movement. Over time, as Boston’s school budget naturally grows, there should be more money available to ship to charters — opening up an estimated 4,000 charter seats between 2018 and 2028, according to a city analysis.